The texturing of this model is very complicated, so I wouldn't recommend doing anything other than modifying the "UNION PACIFIC" and "U.P." on the tender (the lettering is in the alpha channel of UP484UnionPacific.TgPxDx). However, you'd still have "Union Pacific" on the shield on the front of the smokebox and that's not something you can change, because it's rendered in 3D (you have to go up close to it to appreciate that detail). It would just be a ex UP now lettered for the RWA. buzz456 wrote: It would just be a ex UP now lettered for the RWA. Yep, very easy to do - just edit UP484UnionPacific.TgPxDx. I like the sound of that might give it a go. Not to worried about the shield could just say that its a tribute to U.P. Can it be done? I mean 2 letters replaced by 3? Yes, it's just text in white in the Alpha channel. Where did you change the name, in the RBG channel or the Alpha channel? You have to leave the RGB untouched (that just defines the colour of the lettering) but modify the lettering (white lettering on a pure black background) in the Alpha channel. ah i see were i went wrong then ok il give it another go and see where i get. ok so iv changed the lettering in the alpha and got the file back in game. 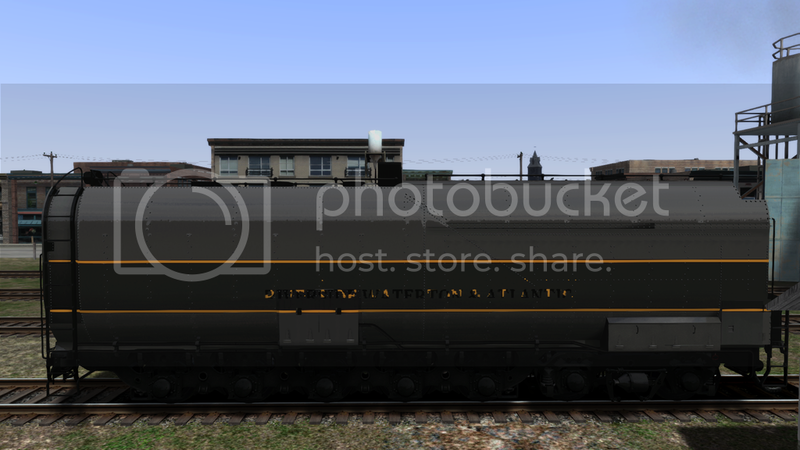 The changes show up in black with the yellow lettering (still reading "union pacific") showing in places do i need to change the lettering in the main file as well??? plewsy2105 wrote: ok so iv changed the lettering in the alpha and got the file back in game. The changes show up in black with the yellow lettering (still reading "union pacific") showing in places do i need to change the lettering in the main file as well??? Send me the files you changed, in a pm, and I'll see if I can explain what's wrong. I have tried to send you a pm however im not able to upload .TgPxDx files probably to do with file protection. OK, I think I know what the problem is. In the version of UP484UnionPacific.TgPcDx for the Overland liveries, I didn't fill the entire RGB uniformly with the colour (silver or yellow) of the lettering. It's actually got the lettering in the right colour, in the RGB too, on a black background. That's why, when you change the lettering in the alpha channel, you see a mixture of black and yellow through that mask. All you need to do is to fill the whole of the RGB with the letter colour. That's how I did it in the default version.